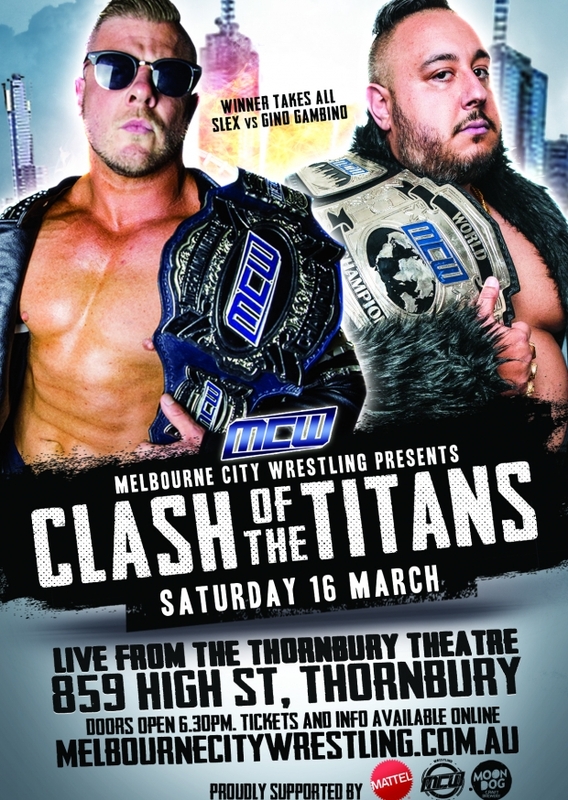 Melbourne City Wrestling returns to the home of professional wrestling in Victoria, The Thornbury Theatre, on Saturday March 16, as we present the CLASH OF THE TITANS! In the main event, for the first time ever, we will see CHAMPION vs CHAMPION, as Gino Gambino defends his MCW World Heavyweight Championship against Slex's MCW Intercommonwealth Championship. With both championships on the line, the WINNER TAKES ALL! The stakes have never been higher, and this is only the beginning, as we have the best professional wrestlers from across the nation who will all be in action on the night. Stay tuned for more announcements regarding this landmark event, as well as ticket on-sale information.